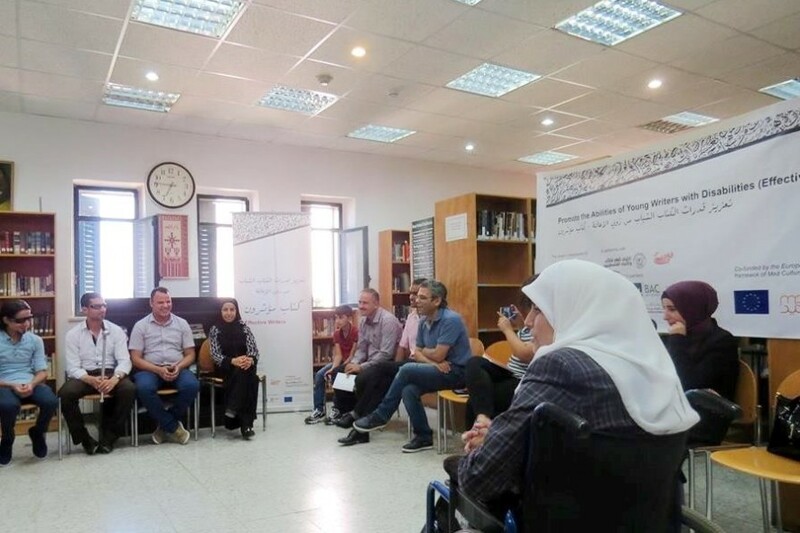 Effective Writers is a capacity building project for writers with disabilities led by The Social Development forum (Gaza, Palestine) in partnership with Fanni Raghman Anni (Tunisia) and the general union of Palestinian Writers implemented in the West Bank, Gaza and in Tunis. It aims to develop the writing abilities of disabled writers, providing them with a platform through which they can express themselves, and publish their writings. The project started with a call for participation, for aspiring writers with disabilities, in the three locations of implementation of the project. Once the young writers were chosen, workshops and training cycles took place, where the candidates learned to develop their writing styles, and courses of creative and applied writing were given. Meetings and talks with well-known writers from the Arab region took place, which allowed the aspiring writers to interact with experts in the field, in order to develop their knowledge about writing, and by connecting with these writers, express the difficulties they face as writers with disabilities. In August, with all the writings produced during the workshops, a platform was created for aspiring writers, with or without disabilities, to publish their poems, writings, short stories etc. The platform now contains writings produced by the candidates, and is progressively receiving more entries. At the end of August, the project ended with the publication of a book, containing the writings of the participants in the project, hoping that this book will launch these aspiring writers into the professional sphere, becoming a step towards a writing career, and a more inclusive society, that welcomes people with disabilities into the cultural community and provides them with equal opportunities as others.